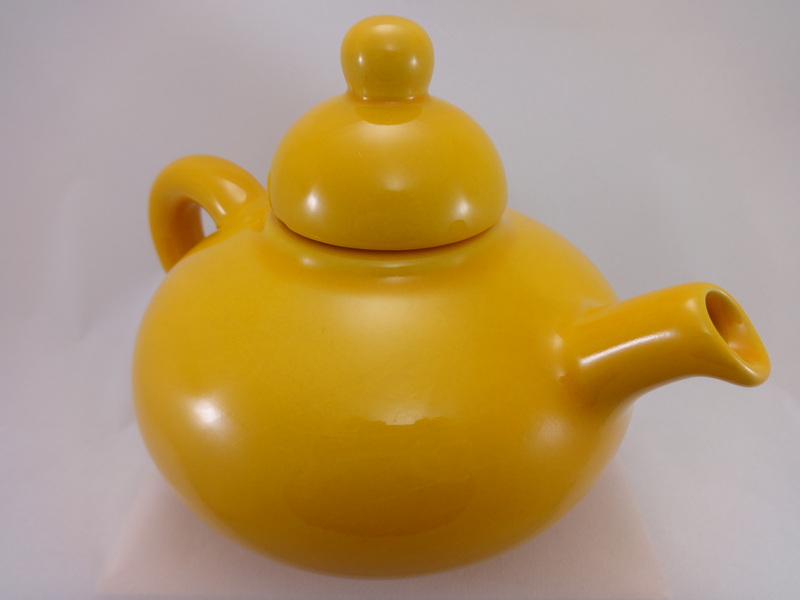 To my mind one of the inspired productions by Ceramique de Beauce (1940 – 1989) was its Chinese styled teapots. These were produced in the 1970s for the Flowerdale Tea Company, also known as Hayhoe Tea. A well known Toronto company along side competitors Thomas Lipton and Mother Parkers, the Flowerdale trade name was active 1968 – 1992. The pots were seemingly commissioned as marketing and advertising tools, perhaps as give-aways. The Beauce mould numbers are 3320 (large) and 3321 (small). Well thought out for the time with bright Pop Mod colours and that blow-up pneumatic form often associated with the period. I have heard the shape referred to as Mandarin or Aladdin. The Beauce designers would have referred to it with a French name no doubt. It would worth hearing how it is referred to colloquially in Quebec. Glazing was high gloss and there was simple range of five colours: red, brown, green, white or cream and yellow. There is also rumour of a blue teapot. If so this colour would be the holy grail for collectors. There is a variant on the spout as well — think “short and stout”. More images to come. The teapot is not the easiest of forms to get right but it is also one that a tea blender would be insistent on seeing perfected correctly. Chinese allusions are prominent with the general choice of form and colours and the pot looks like some variation of what are called the Yixing teapots. Teapots are generally classified as high profile and low profile often related to the spout placement and the type of tea to be brewed. For a quick lesson on the mechanics and connoisseurship of tea and Chinese teapots in particular click here http://store.thechineseteashop.com/Yixing_Teapots_s/23.htmck and here http://www.jingteashop.com/cat-jing-tea-shop-yixing-gallery.cfm Be prepared for a long browsing session. If you have information or a leads on the collaborators and designers please post or forward them to me. Thank you! While I have almost 30 Flower Dale teapots in the 5 colours mentioned, my girlfriend had the blue one in the larger size but would not sell it to anyone. It definitelg exists. Unfortunately she and the coveted teapot moved away about 1990 and I have been searching ever since. Thanks — !the black swan of flowerdales exists! Do you know anyone who had a white or cream colored Flowerdale teapot for sale? Did you ever find the blue one?? I don’t know any place or person that might have one. Etsy & Ebay are probably as good as anything outside of an Antique Mall or flea market. If I have any you will see them here. Thanks and if the blue does exist you will see it here! Good Hunting. In the late 60’s I was employed by a major Business forms company in Canada and Hayhoe/Flowerdale was one of my clients. As well as designing business forms I was active in logo and brand development. I came up with this design and it was approved by the purchasing people and production was began. I have the first one that came off the line ….a brown one wish I treasure. Wayne: Thank you this is so interesting. Nice to put a name to what I always thought was a Beauce designer. Are you still active and did you do other product designs?